Two movies have opened recently in which the central character use to be top of his game, but time and their past deeds have caught up to them, leaving a ruin in his place. Liam Neeson has recently suggested that he is retiring from the action genre that gave new life to his career with the unexpected, but very effective, success of that modern day version of John Wayne’s The Searchers, Taken. After that, it was movies like The Grey and A Walk Among the Tombstones as well as others whose title seem to suggest just where this through line was going. Now, he’s playing, Jimmy, aka The Gravedigger, an over the hill hit man, someone who has seen better days but now falls asleep drunk in a bar and farts while out, only to awaken in order to humiliate himself by asking for money from Danny, the son of his old boss and best friend, Shawn. In order to earn the money, he has to play Santa. Things take a bad turn when Jimmy’s estranged son Mike sees Danny kill someone in a drug deal gone bad. Things take an even worse turn when Jimmy kills Danny in order to stop him from killing Mike. And then things take an even worse turn when Shawn has all his men focused on killing Mike and then killing Jimmy once he knows his son is dead. Survival means not only stopping Shawn and his army of goons, but taking them out permanently while preventing Mike from killing anyone on his own. Whew. Now that’s quite a set up. And it’s actually a pretty nifty one. The screenplay, by Brad Inglesby (who also gave us Out of the Furnace), is often very clever and, maybe more importantly, just never stops–it is very, very much truth in advertising when it comes to the title. And the story’s filled with above average characters with realistic, gritty and tough dialog, even in very small and throw away parts (the big exception might be with the women who never really are anything more than just there because, well, men tend to get married and have women in their lives so what can you do about it but include them for realism’s sake). When it comes to the plot, the set up and how Inglesby works it out and makes everything pay off is its strongest part. It’s a very well built piece of clockwork. It’s not perfect. The first act is made up of a rather large number of coincidences. At the same time, these bits of fortuity are fine because they are clever, even maybe witty at times, and it’s smartly done. At the same time, there does come a point when perhaps the coincidences become maybe a bridge too far. The exact moment this happens is when the two police officers who answer the call for Danny’s shooting, out of all the officers in New York City, just happen to be the ones on the payroll of Shawn. That’s when it became a little too much for me. In addition, it’s also one of those movies where the police show up at times more for the convenience of plot than logic. In the first act, Danny is running all over a middle/working class neighborhood shooting over what seems like hundreds of rounds of ammunition and no one calls the police and none show up. Then when two of New York’s finest show up in answer to a call (a call from Mike) it’s only those two officers on Shawn’s payroll. And later when Jimmy and Mike go to a housing project, someone just sees them going door to door and calls the police (I suppose one could say that in a reverse of stereotypes, hard working class white New Yorkers are the ones who don’t want to get involved, while minorities are more than willing to do the 911). At the same time, it’s so well done, the basic concept so intriguing, the whole thing so exciting, the characters so interesting, that you find yourself being more lenient that perhaps you should. Yeah, I didn’t buy all of it, but it’s one of those movies where I’m not sure I ultimately cared. And Inglesby also defies genre expectation in one odd, but effective way: theoretically, the final show down should be between Jimmy and Shawn. Instead, Shawn is taken out and then the final shoot out is between a character who is actually rather unimportant and whose connection to Jimmy is vague. Definitely not a how to write a screenplay book choice. But what also helps sell the whole thing is the direction by Jaume Collet-Saura (who also gave us Orphan and Non-Stop). Collet-Saura does some amazing camera work, having it soar through the sky and cross town on wings of eagles; and go through fences as if they weren’t there; and sweep down streets and alleyways at top speed. In many ways, it may be one of those movies in which the talents of the writer and director perfectly complement each other to form one strong film. 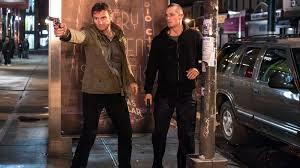 And what Neeson film of late would be complete without chase, fight and action scenes. And yes, there are some real doozies here, quite a few exciting second unit set pieces (one very effective one in that housing project and another, a showdown in a tavern). Still, I doubt any of this would be all that effective without the strong cast. Neeson and Ed Harris play Jimmy and Shawn, and you can see the years of their relationship in the wrinkles and wear and tear in their faces and how they talk to each other. Joel Kinnaman of The Killing and Boyd Holbrook of Little Accidents play the sons, Mike and Danny. I’m not sure they quite come up to their elders, but they play their roles with a palpable electric energy. But perhaps the strongest performance is Vincent D’Nofrio as an honest cop who feels haunted and guilt ridden by his inability to take down Jimmy. It’s an incredibly empathetic performance and he pretty much takes over any scene he’s in. With Bruce McGill as Shawn’s right hand man; Common as a young hit man; and, in an uncredited cameo, Nick Nolte as Jimmy’s Uncle. In Faults, the new film and first feature from Riley Stearns, Ansel, a broken down former cult deprogrammer (god, that takes me back; who ever thought cult deprogrammers would be a part of nostalgia) is now reduced to hawking his second rate follow up book to his first immensely successful one while scamming hotels for meals, towels, shampoo and soap. Ansel is one of those particularly repellant characters that is pretty despicable from the moment you lay eyes on his sweaty, nervous countenance. Yet at the same time, there is something incredibly intriguing about him, something absolutely fascinating. One wants to know exactly what happened to him. He’s played by Leland Orser, a character actor who has been seen in everything from numerous television shows to Se7en (the crazed man in the massage parlor) to Taken, and he uses his off kilter, sagging and rat a tat tat delivery to good use here. It’s a strangely repulsive and empathetic performance at the same time. The plot revolves around a couple who need help in deprogramming their daughter who has joined a cult called Faults (not “the” Faults, as is carefully pointed out). Ansel doesn’t want to get involved because his last attempt at programming ended up in the person dying and he’s never recovered. So Ansel has the daughter abducted and taken to a motel room, but things don’t go as planned. Everything is just a little off (in fact, the abduction itself is a bit too easy not to sound an alarm of some minor kind) and things don’t proceed quite the way they usually do and some really odd things happen (like the daughter somehow ending up outdoors though she was locked in a room). But Ansel is too desperate to fully take stock and really think things through. What happens then is a series of mind games played by the various characters until the not quite unsurprising conclusion (there were only two real possibilities and the one chosen here was the most likely). In one way the ending is very satisfactory. At the same time, it begs a huge question. Why? What was it about Ansel that made the daughter do what she does to him? And in such a complicated and chancy way? It’s sort of like killing an elephant with a flea. It’s unclear exactly what she gets out of it, what’s in it for her. In addition, by doing what she does, Ansel is now a wanted man and will only bring the wrong kind of attention on her and Faults. It feels like a little something is missing here. At the same time, overall, this is a very involving and riveting little indie film that is well worth the time. With Mary Elizabeth Winstead (Bruce Willis’s daughter in Live Free or Die) as Claire, the abducted; Chris Ellis and Beth Grant as her very creepy parents; and Lance Reddick as Mick.